Fleet Livery vinyl wrap are used for promotional branding. Justin Murray has given a hand to a number of the leading UK companies in recent years, delivering work for advertising agency BBH, Marvel, Greenpeace as well as BSkyB. Woking on all these projects are equally intriguing, and demanding. Every person involved in the project plays an important role to ensure the project runs effectively. 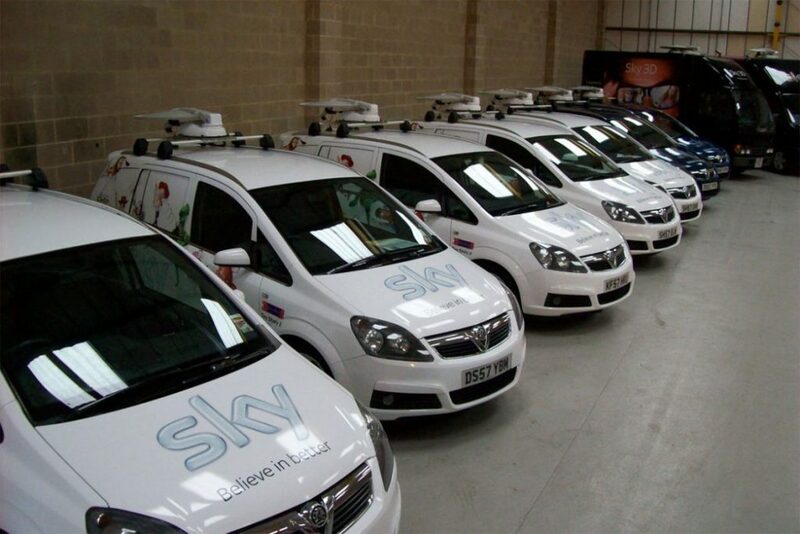 The TV production company launched this assignment towards the end of 2010, and one by one, each Sky sales vehicle reached the installation facility to endure its new vinyl wrap and rebrand. 25 marketing and promotional vehicles in total passed through the installation centre. 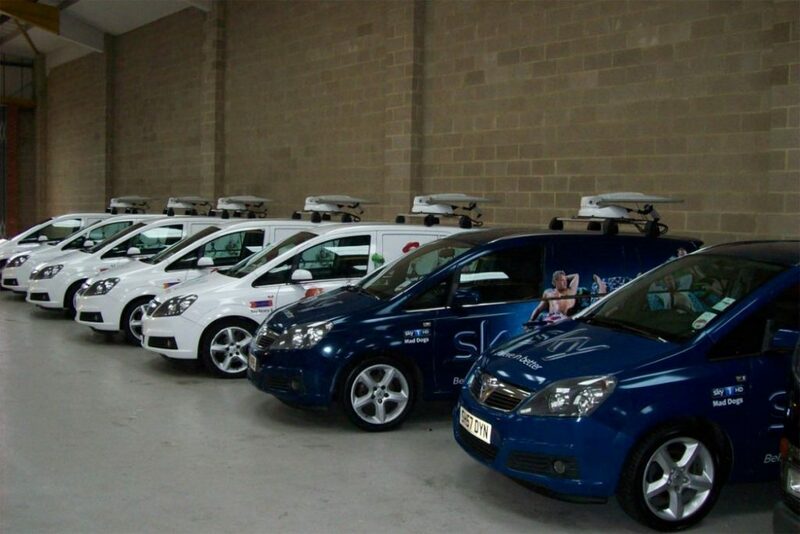 In over 2 months, such as Vauxhall Zafiras, Smart cars as well as a couple of mobile exhibition Trucks. Each vehicle had an old vinyl wrap covering which needed removing, was delivered the installation centre by a 3rd party driver, examined and signed in at office reception. Fleet livery is ideal for promotional use. The Fleet livery was initially checked over by Ken Priddy (of Ken Priddy Sound ,Lighting, Communication,) who maintains all the audio-visual equipment inside the vehicles and had set up base in the hangar next door. Ken and his crew started the procedure of evaluating each car and truck as well as examining and mending the interior Hi-Tech devices such as satellite dishes and High Definition televisions that are installed into each vehicle. Each vehicle ended up being transferred into the vinyl installation area where the squad started to remove the previous printed vinyl wrap. The cars and trucks had previously been entirely wrapped, and the procedure of removing the vinyl was an extensive one! Once the old vinyl wrap had been removed each car was then washed and arranged for the next installation phase. 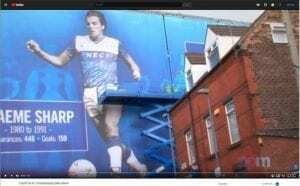 The graphic designers analysed and revised the designs provided by the designers to ensure the vinyl wrap graphics would match the vehicle’s specific proportions which significantly lower resources waste, once printed. 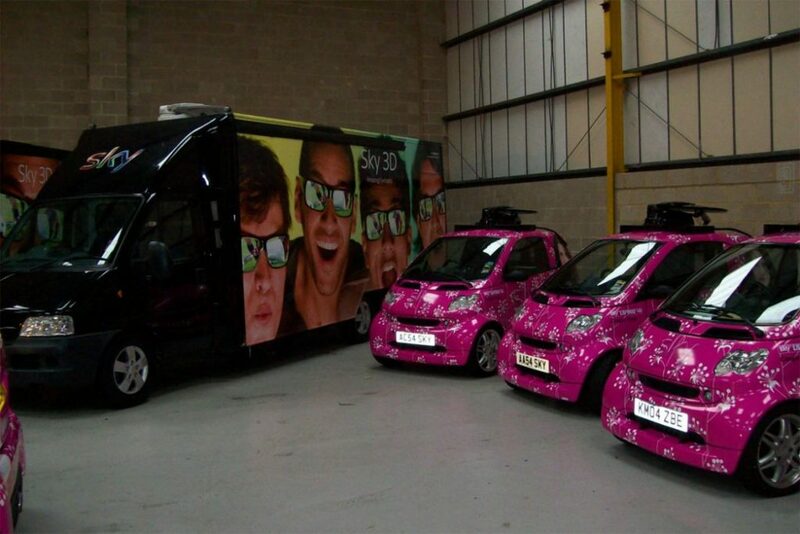 Having double checked the supplied vinyl wrap designs matched the vehicles shape to the visuals, it was then passed down to the print production plant where it was digitally printed using a HP5000 inkjet printer. We decided to print on the Avery 1900 cast vinyl which is ideal for short-term wrapping but also long-lasting, because of its high quality and surface finish. The installers then set out on applying the vinyl wrap to the vehicles. Once finished the car was delivered back again to the hangar to wait a complete valet. Soon after the remaining cars and trucks had gone through the vinyl wrapping procedure, it was then time for several of the fleet vehicles to leave the factory and return to Sky. Third party drivers gradually began to return to collect the vehicles, and each one was thoroughly examined and signed out before the car keys were handed over. The remaining vehicles were stored in the hangar until Sky came back with their film crew. Sky used the property to shoot their newest instruction video for internal purposes, and spent a few days at the installation centre. Once sufficient footage had been shot, the remaining vehicles were then signed out, and the job came to a close. For some of our latest fleet livery print projects please visit our blog page.